PRINCE ALBERT, SASK. 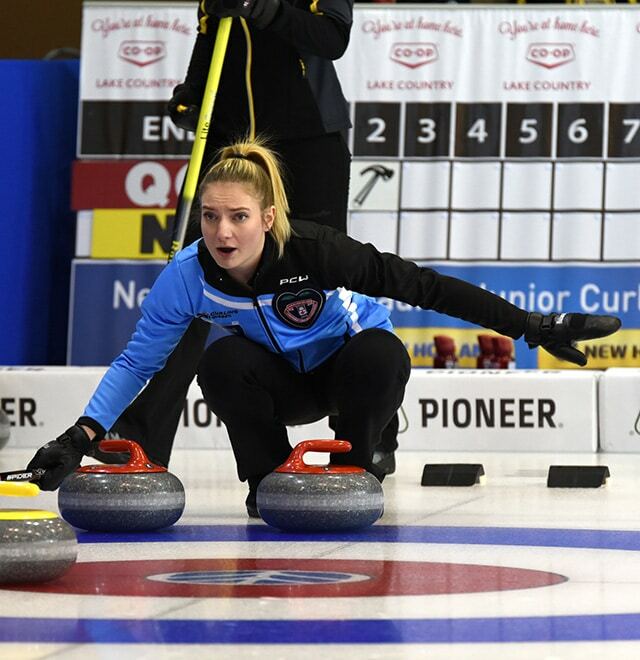 — Alberta’s Selena Sturmay has one more game to play in the Championship Pool at the 2019 New Holland Canadian Juniors, but she knows one thing for sure: her team will play in this Sunday’s final for the opportunity to represent Canada at the World Junior Curling Championships. The team from the Saville Community Sports Centre in Edmonton secured the spot with its 7-6 victory against New Brunswick’s Justine Comeau (Capital Winter Club, Fredericton) at the Prince Albert Golf and Country Club on Thursday night. Heading into the final end and tied 6-6, Alberta sat one on the back of the button, forcing New Brunswick into a difficult double raise on Comeau’s last. The shot didn’t curl up enough, providing Alberta with the 7-6 victory and a perfect 9-0 record with one more game to play in the Championship Pool. New Brunswick dropped to 4-5 with the loss. New Brunswick limited Alberta to one in the opening end and blanked the second. This set up the first deuce of the game by New Brunswick in the third. Sturmay, a nursing student at the University of Alberta, had an opportune double to score four, but it clipped a stone in the back of the house, limiting her team to two and a 3-2 lead after four ends. Alberta increased the lead heading into the fifth-end break after forcing Comeau to play a double which she jammed to give up one. With no guards in play early in the sixth end and a two-point lead Alberta opted to keep the sheet wide open by throwing hits and limiting New Brunswick’s chances of putting together a multi-point end. All that was left in the house on New Brunswick’s last was an Albertan stone. Comeau blanked the end, retaining the hammer and regained the lead in the seventh end. Alberta’s final freeze attempt wasn’t solid, providing Comeau with a hit to the inside for three and 5-4 lead. Alberta took back the lead in the eighth end, but also missed out on an opportunity for more points. New Brunswick missed its final double attempt, setting Alberta up with a draw for three. But Sturmay pulled the string and the sweepers couldn’t get it to the house meaning Alberta had to settle for two and a 6-5 lead. Alberta regrouped in the ninth, forcing New Brunswick to one and providing Alberta with the hammer in the final frame. “I think our patience helped us in this game. We had a couple misses early on, but we allowed ourselves to calm down, focus in and make some more shots,” Sturmay said. 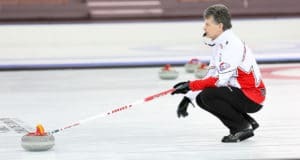 Over at the Art Hauser Centre, Quebec’s Laurie St-Georges (Club de Curling Laval-sur-la-Lac) secured a 7-2 record after defeating Northern Ontario’s Kira Brunton (Curl Sudbury) 9-4. Her team was aided by a steal of three in the fourth end which set the tone for the remainder of the game. Quebec will take on Nova Scotia’s Kaitlyn Jones (Halifax Curling Club) on Friday morning and a win will get her into the semifinal. Jones (6-3) won her game to remain in the playoff picture against Manitoba’s Mackenzie Zacharias (Elmwood Curling Club, Winnipeg) who now sits at 5-4. Jones needed all 10 ends to win this one, picking up a single in the final frame to win 7-6. 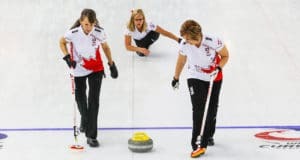 British Columbia’s Sarah Daniels (Delta Thistle Curling Club, North Delta) also has a 7-2 record and remains in the playoff picture, but had Thursday night off. The men’s Championship Pool has two clear-cut contenders and a pile of teams still in the hunt for the final spot. The top three teams – British Columbia’s Tyler Tardi (Langley and Victoria Curling Clubs) and Saskatchewan’s Rylan Kleiter (Sutherland Curling Club, Saskatoon) with 8-1 records and Manitoba’s JT Ryan (Assiniboine Curling Club, Winnipeg) at 6-2 – all had the night off. Quebec’s Vincent Roberge (Club de Curling Etchemin) picked up an 8-3 win against Newfoundland and Labrador’s Greg Blyde (RE/MAX Centre, St. John’s Curling Club) that provides both teams with 5-4 records. 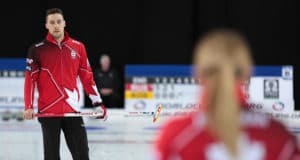 Meanwhile, Northern Ontario’s Tanner Horgan (5-4) of Curl Sudbury remained in contention with a 9-6 victory against Alberta’s Desmond Young (4-5) of the Saville Community Sports Centre. Those teams with five wins can be part of a tiebreaker scenario if they win on Friday morning and Manitoba loses. The last of the Seeding Pool games at the New Holland Canadian Juniors were played on Thursday night. In the women’s division Prince Edward Island’s Lauren Ferguson (Cornwall Curling Club) defeated Nunavut’s Sadie Pinksen (Iqaluit Curling Club) 17-4 to improve to 2-7. Nunavut finishes the New Holland Canadian Juniors with an 0-8 record. Over in the men’s division, Jack Smeltzer of the Capital Winter Club defeated Nunavut’s Javen Komaksiutiksak (Iqaluit Curling Club) 15-4. New Brunswick ran the table in the Seeding Pool to finish with a 6-3 record. Nunavut finished the championship at 0-8. Prince Edward Island’s Tyler Smith (Charlottetown Curling Complex) ended with a 9-5 victory against Yukon’s Trygg Jensen. P.E.I. finishes at 4-5, while Yukon closes out at 1-7. Action continues at the 2019 New Holland Canadian Juniors on Friday at 9 a.m. and tiebreakers, if necessary, at 2 p.m. (all times Central).